Using our Sand Bag Mooring Kit from Carver Industries is as easy as filling the bags with sand and clipping them on to your boat cover's tie down loops! 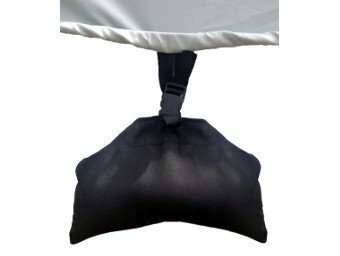 These bags are designed to securely anchor your cover in place while your boat is being stored on the water. Just affix these bags evenly to the sides of your boat cover and use the adjuster buckles to keep the bags at the proper height. This kit includes 4 mooring bags which are black in color and made from a strong marine grade polyester. The bags feature a hook and loop closure. Made in the USA by Carver Industries. These bags can be utilized with any boat cover which features tie down loops in its hem, such as the ones we offer by manufacturers Carver and Westland. Fill each bag with sand (not included) and close the bag using the hook and loop closure. Each sand bag will weigh about 7-8 pounds. Attach the sand bags to the tie down loops, making sure to evenly space your bags. The weight of the sand filled bags will create tension on the cover and allow it to secure properly to the boat. Do not trailer with sand bags installed.